I was at a seminar recently in which a friend of mine was doing a presentation on journalism, religion and public life. 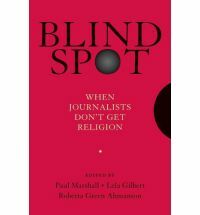 I warmly recommend his book, which is an edited volume consisting of some rather helpful commentary on reading and enlisting religion in the public square: Blind Spot: When Journalists Don't Get Religion. Having done a bit of public policy and public life stuff myself, I asked him: how do you define religion? His answer was: context, context, context. Who are you talking to? What's your audience? What they mean by religion, is more important than what you mean. Communication, he argued, is not about what you say; it's about what the other person hears. His example: if a journalist asks me whether I believe in the separation of church and state, I don't go into a long explanation about why I think life is religion; I say "yes." And, frankly, so do I. Academics have the pleasure of making longer, more sustained arguments, in order to nuance the debate and its language. Public intellectuals don't. They use the tools at their disposal, best as they are, to make proximate points toward better policies. I like what Lori Halstead Windham of the Becket Fund said recently at an event on human dignity. In our work we want two things: to reform and expand the public concept of religious freedom, and a win. But we'll take a win.